This is a screen capture from @Dev's Twitter video. Since tornadoes are (incorrectly) believed to be a uniquely American storm, I thought the tornado and flag were a nice combination. As I have previously discussed, meteorologists hate tornado damage and injuries as much or more than everyone else. However, we are in a unique situation: if we forecast a tornado and none occurs, then it is the (emphatically incorrect) "you guys never get it right!" 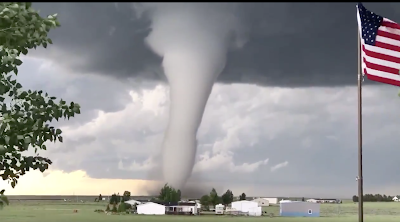 So, once we have forecast a tornado to occur, we are cheering for a tornado like this one to occur. Highly visible, so the public knows the warning or forecast was correct, but harming absolutely nothing.